Operate allows you to publish your meetings rooms to a wide audience using the Space Publisher feature. This tool enables you to link your Operate account to office space aggregator platforms. Here are the aggregators that we currently work with, and some details about how to set up your integration with them. Each Aggregator will require your Location ID and Resource ID (or room ID) in order to create a link between their system and Operate. Your can find your IDs by going to Space > Space Publisher. Your Location ID is listed next to each of your locations. To advertise spaces through Davinci Virtual, you will need to have an account with them for each Location for which you want to advertise rooms. To set up these accounts, you can contact Davinci directly for their assistance in setting up your location. You will need to provide them with the Location and Resource IDs of the rooms which you would like to advertise. See here to find out how to find your IDs in Space Publisher. To advertise with LiquidSpace, you will need an account with them. You can then reach out to their support team and provide your Location ID and Resource IDs. See here to find out how to find your IDs in Space Publisher. If you already have an account with Davinci Virtual, let them know when you contact them. With Meetingrooms.com, you can configure your account yourself using their self service portal. To integrate with Meetingrooms.com, you first need to set up an account and register your venue. You can then go to the External Software area and select Operate as the Software option. You will then be asked to enter the Location ID (See here to find out how to find your IDs in Space Publisher) and save. Your accounts will then be linked and after refreshing the page, your enabled rooms will be displayed under your location, ready for you to add further details and make available for bookings. If you already have an account with Meetingrooms.com, you can manually link your venues and meeting rooms already in the system to your Operate ones. 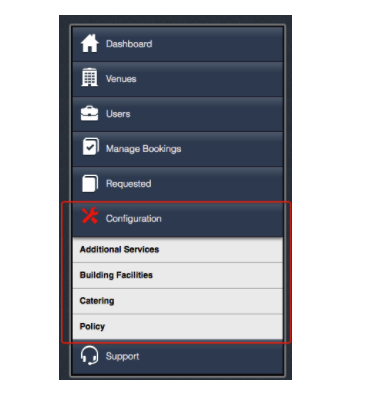 When logged into your Meetingroom.com Venue Dashboard, simply choose 'Add a new Venue', the add the Location ID as described above. Once your rooms are visible, you can add extra details such as an image and indicate any extra services (Air Conditioning, Video Conferencing Facilities). You can also add catering items that you would like to make available. Note that meetingroom.com requires that you specify a Layout for a room to be available for bookings. Even if you have specified a layout in the Meeting Room Product in Operate, you need to indicate the layout in meetingroom.com. If you would like customers booking through meetingrooms.com to make use of catering services such as tea and coffee, you can add these under the Catering section. You can also describe additional services and building facilities that you would like to be displayed.